These are great for work, home, school and college planners. You can print as many as you need! 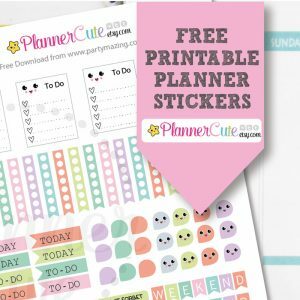 cute stickers for your planner or your cute projects. Perfect for the Erin Condren planner and other types of planners – Filofax, Kikki K, Plum Paper, etc. You can print the file as many times as you want! Please note that the colors may vary slightly from what you see on screen. 1. Use sticker paper (matte or gloss). 2. Print your PDF file on your home or office printer. 3. Make sure that you print file in ‘ACTUAL SIZE’ with no scaling! 4. Cut the stickers using scissors or cutter. ♥ These items are for your PERSONAL USE ONLY. ♥ You CANNOT resell items as they are OR print and resell items. ♥ You CANNOT use items for commercial use. ♥The files that you receive may not be copied, shared or distributed in any way. Because the item is an instant download, there are no refunds or returns on this item. Ready for some kawaii fun for your planner? These are great for your school, work, home and college planners.